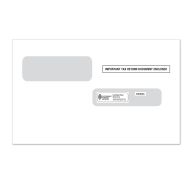 The Mines Press selection of tax form envelopes includes options that are compatible with the most up-to-date versions of W-2 and 1099 tax forms. Available in the traditional IRS 2-up format, as well as in 3-up and 4-up alternate formats, with your choice of gum seal or self-seal adhesive. 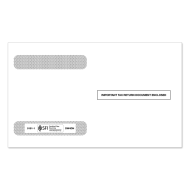 All of our single and double window tax form envelopes are equipped with inside security tint to help you keep confidential information safe. Tax form envelopes will add a professional and cohesive finishing touch to your firms' work. 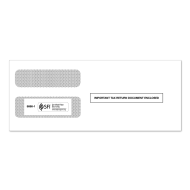 Having the right envelope for the right form is the most efficient way to distribute tax forms, while providing only the information need it in a clear display. 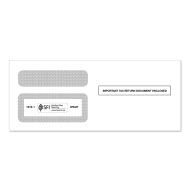 Our single and double window tax form envelopes are equipped with inside security tint to help you keep confidential information safe. The Mines Press selection of tax form envelopes includes options that are compatible with the most up-to-date versions of W-2 and 1099 tax forms. Available in the traditional IRS 2-up format, as well as in 3-up and 4-up alternate formats, with your choice of gum seal or self-seal adhesive.